I've had the most lovely start to my week; I held the last of my Winter workshops here at my cottage, The Little Green Door. For the classes, I designed this little winter sampler to incorporate some of the basic stitches that I regularly use in my work. I love the colour palette with its tiny lazy daisy leaves, pale pink ranunculus and white snowberries. Sometimes I can't quite believe that my work has moved in such a different direction. 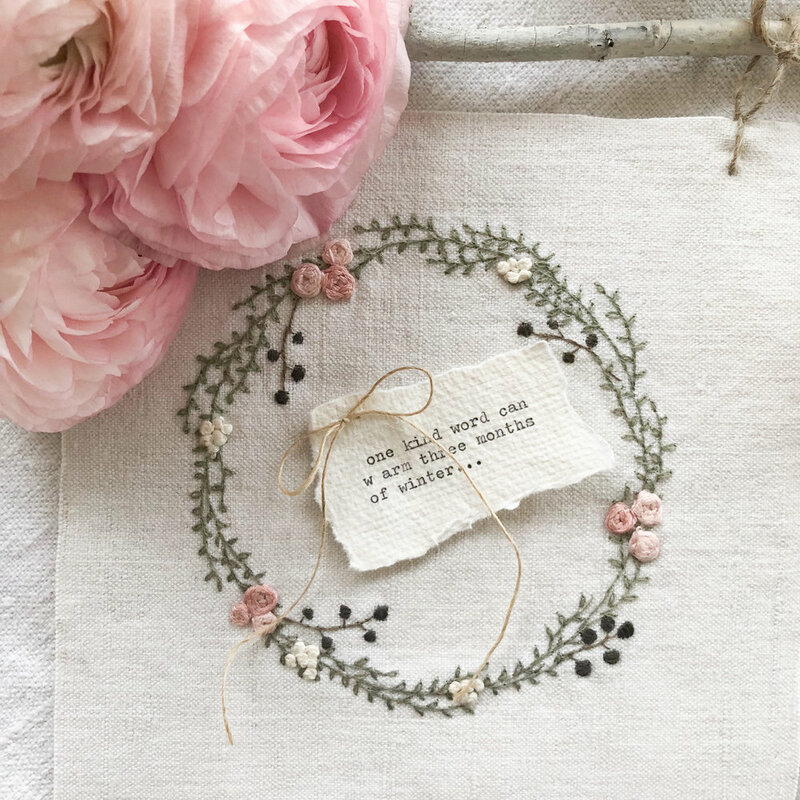 Having worked in publishing and banking for more than 20 years it is so refreshing to now spend my days drawing, stitching and making up packages of pretty antique fabrics. I have been sitting around my kitchen table this week teaching the most lovely group of women, serving cake and listening to stories from so many interesting, cosy, lives. Sharing my love for the gentle pass-time of stitching. I couldn't help but think of the contrast between corporate meetings, wearing a suit and heels, carrying laptop bags, minuting discussions about LIBOR and drawdown dates. So here I am today, tidying up the leftover cake (*dabs mouth with napkin*) and threads, planning patterns and colours for the spring workshops starting on Monday 19th March. I will be teaching a series of little flowers, shrubs and foliage which can be stitched simply, on their own, or incorporated in larger pieces of work such as wreaths, containers, garden borders and meadows. If you fancy coming along to a workshop you can book here or sign up to my newsletter here for advance notification of classes. I've been catching up on admin today and this afternoon I am going to work on a piece for my grandmother before I finish off one final commission. I have a few busy days ahead of me - I'm going to be trawling the country collecting furniture and packing up my workroom.... I'm on the move! Cannot wait. I will leave you with a pretty little pixie who came to my class this Monday with her gorgeous creator, Christina. Both arrived in a soft scented cloud of delicate perfume and blush pink knitwear; I was rather taken with both of them upon sight. (I bought Juliet via the @cr_auction account on instagram where Maria of Sugar and Spice Furnishings raises money for cancer research selling donated items from very talented makers and small businesses).